Accurately determining the mass of lightweight samples is very important in many fields of research. In order to accomplish this, high-resolution analytical balances are an integral piece of equipment. Additionally, many technically relevant processes occur under technically demanding conditions such as high pressure, extreme temperatures, and aggressive or toxic atmospheres. Commercially available analytical balances cannot be used under these conditions. Therefore, the technology of the Magnetic Suspension Balance has been developed. 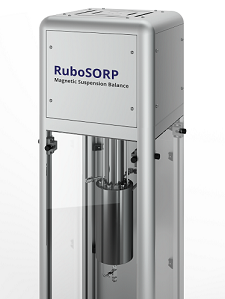 RuboSORP´s Magnetic Suspension Balance technology offers the unique possibility of high-quality analysis under even the most extreme metrological conditions. Magnetic Suspension Balance technology allows high resolution mass determination under extreme conditions. An industrial microbalance is located outside the cell. Thanks to contactless magnetic suspension coupling, mass changes within the pressurized cell can be determined. When perfroming a measurement, the sample whose mass change is being measured is attached to a permanent magnet. The actual position is detected and controlled via a high-performance PID controller. In order to establish a free levitation position for permanent magnet and measurement object, voltage is applied to a electromagnet outside of the measurement cell. This allows the sample mass to be measured contact free under extrem conditions. Load decoupling allows the object weight being measured to be substracted for taring or calibrating the measurement signal. In this case, only the permanent magnet remains in levitation position (zero-point position). When measuring point is selected, the measurement object is liftet, corresponding weight is detected by the microbalance. 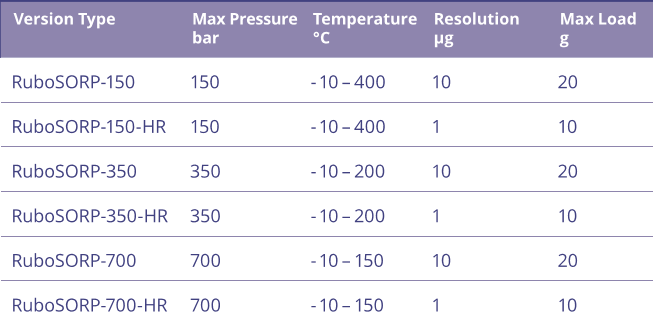 The measurement objects can be a crucible, containing sample material, for example being used to measure adsorption isotherms or catalytic reactions. In addition, the measurement object could also be sinker with calibrated volume for high accurate density measurement of the sinker surrounding fluid. 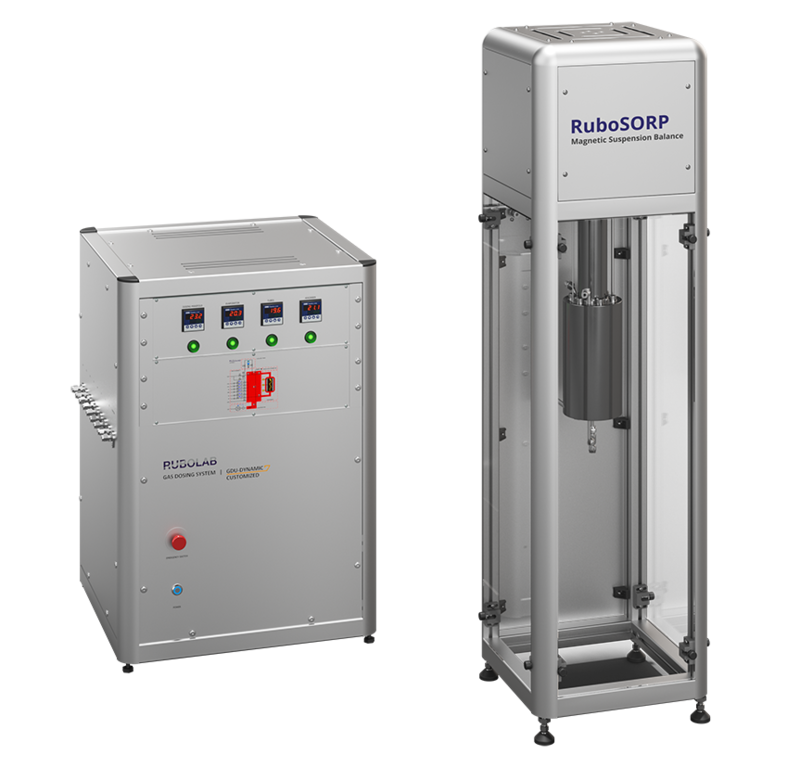 The RuboSORP Magnetic Suspension Balance is an advanced technology for measuring the mass of two measurement objects at the same time. The unique technology ensures measurements within a pressure range of up to 700 bar and a maximum temperature of 400°C. 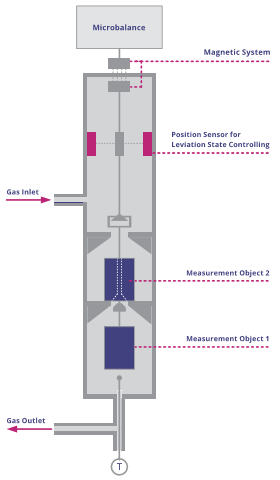 The measurement cell and all components in fluid contact are resistant to aggressive and toxic atmospheres. Due to this, a variety of different fluids can be used, e.g. inertgas, aggressive and toxic gases, supercritical fluids, flammable and explodable gases, gas mixtures and vapor. The Magnetic Suspension Balance can simultaneously measure two different sample materials or sinker (Dual sample version). The Magnetic Suspension Balance is also available in a viewing cell version, allowing the visual observation of fluids and materials inside the measurement cell. The Magnetic Suspension Balance can be equipped with a forced flow though sample crucible which improves interaction between sample and surrounding fluid atmosphere. The Balance is equipped with unique features, e.g. a self-optimizing Magnetic Suspension Balance controller as well as a failsafe high speed ethernet interface. The software which will be used for controlling RuboSORP Magnetic Suspension Balance contains an integrated calculation of measurement uncertainy according to GUM guidelines (Guide to the expression of uncertainties in measurement). This allows a more holistic view of data and best level of scientific work. 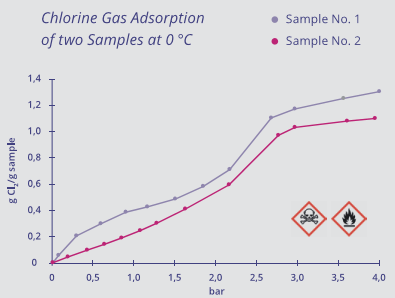 The figure shows the experimental results of adsorption measurement using highly toxic chlorine gas. This data was collected simultaneously on two materials within a pressure range of up to 3.5 bar at 10°C. For this purpose, the Magnetic Suspension Balance has been equipped with two sample crucibles to measure both samples at the same time (dual sample measurement). With increasing usage of biogas as energy source, the corresponding purification treatment of its gas components has become increasingly more important. 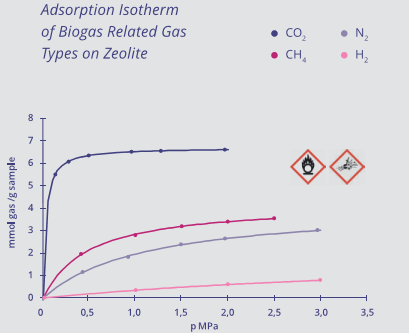 The figure shows the pure gas isotherms of CO2, CH4, N2 and H2 measured on zeolite, which is an industrially used sorbent for biogas purification. In combination with an appropriate dosing unit, the Magnetic Suspension Balance can also be used to measure the corresponding gas mixture adsorption. Sinkers with a known volume can be used instead of sample crucibles for high accurate determination of fluid phase density, even in supercritical atmospheres. 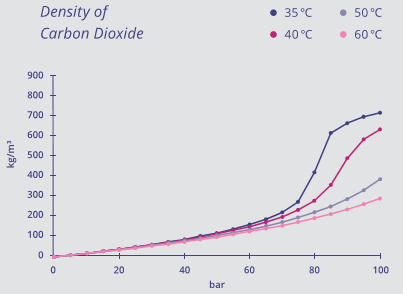 The figure shows density data of CO2 measured in sub-critical and supercritical state. 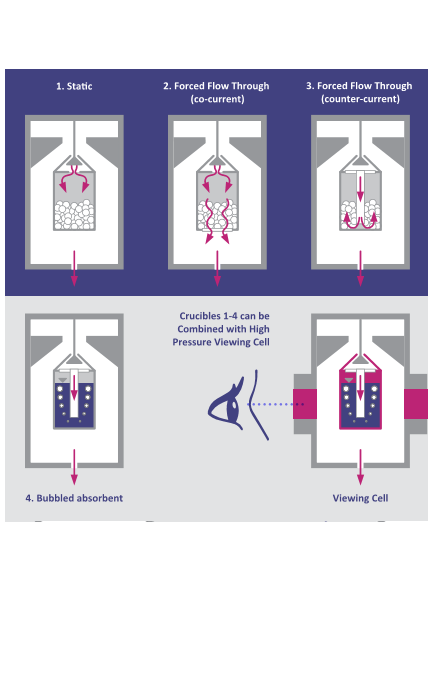 By using a sinker and sample crucible as measurement objects a combined measurement of adsorption and fluid density can be obtained. In combination with our Gas Dosing Units, the RuboSORP Magnetic Suspension Balance can be used as fully automated measurement instrument. Rubolab´s gas dosing units are often designed according to the customer´s specifications. The standard versions can be devided into two general groups: the GDU DYNAMIC and GDU STATIC series. GDU DYNAMIC series units are used to generate dynamic atmospheres within connected Magnetic Suspension Balance. These systems contain several types of thermal mass flow controllers to generate pure gas flows and defined gas mixtures. Depending on the existing fluid flows, the system pressure will be controlled using a front pressure controlling valve. In contrast, systems of GDU STATIC series generate statically pressurized atmospheres within the Magnetic Suspension Balance using pulsed width controlled dosing valves.